In a good way! Don't you just feel compelled to buy this shoe? Doesn't this blog post induce feelings of want? Anthology is on a roll! This shoe, called "Shanghai" looks like it could be your go-to shoe if you're looking for something different. Part loafer, part ballet flat and seemingly inspired by NewbarK (“an English men’s slipper meets a Moroccan babouche meets something you might find at a Japanese spa" according to Maryam Malakpour as told to Vogue), except this looks a lot more sturdy and can withstand a lot of walking around, I can so see myself wearing this with skirts, shorts, slouchy grey sweatpants or harem trousers for that chill, effortless vibe! These shoes aren't up on the website yet, but already available in all Anthem stores for Php2,795! 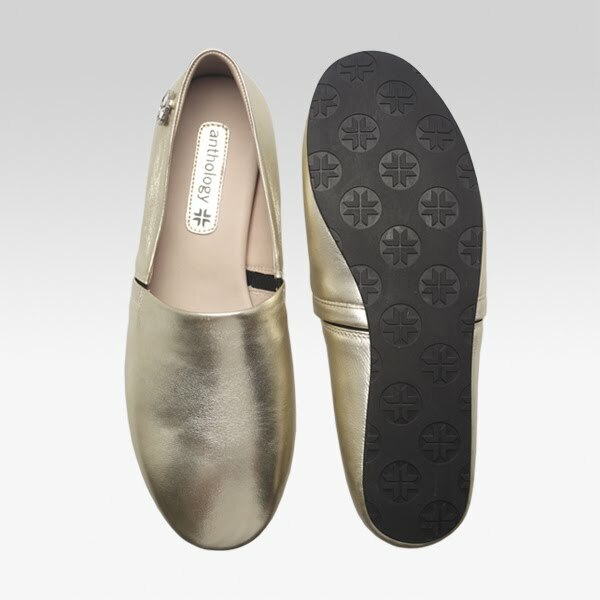 Comes in gold, silver and black patent with rubber soles! Go get one, na! Incidentally, you can still join Anthology's Free Pair of Neons Promotion! Ends June 18, 2010, winner to be announced on June 19! Ooh they do look cute! Close enough, they look like Tory Burch's :) Lovely! Yeah, they ARE cute, a loopy life! How much does shanghai cost?